Cup specialists, Carniny Under 15s produced another great performance for the third week in a row in the NIBFA Cup. 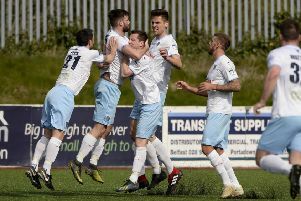 The Ballymena Reds knocked out Carrick Rangers by two goals to one to go into the hat for the quarter final draw this week. Aidan Graffin made the Under 13s long trip to Fermanagh worthwhile when his hat-trick helped his team to an enjoyable 3-1 win over Ballinamallard. The Under 17s shared the points with Ballymoney Utd on Friday evening with their keeper in top form keeping Carniny at bay. This also seemed the case for the Under11 Youth team in Lisburn when they lost out by a single goal to Annalong, unable to break down another in form keeper. The Under 12s can feel annoyed that they didn’t hold on to their three goal lead seeing Andersonstown come back an win the game 5-3. The Under 14s struggled with injuries in their loss to Larne Youth whilst both the Under 10 and U11 Amateurs teams were left disappointed with all The NWCDYL games called off at Ballysally. The Under 15s wrapped up their weekend with a visit to McDonald’s, Ballymena where the local restaurant presented them with a free set of meals for the squad. McDonald’s, the clubs kit sponsors kindly donate a set of meals once a month to the club’s nominated Team of the Month’. The club were delighted last week to receive official acceptance into the popular Foyle Cup Tournament this summer up in Derry/Londonderry. With the tournament well oversubscribed this year, the club received official confirmation of their entries at Under 10, Under 13 and Under 17 levels. Carniny Youth have a long association with the tournament and their loyalty has been rewarded with the entries. Carniny Youth 0, Annalong 1: After a scoreless first half, Annalong scored the first goal when from a goal kick the ball eluded the Carniny defenders for Annalong striker to score. Carniny: McGrath, Clarke, Farenden, Hanna, McPeake, O’Boyle, Fletcher, Larkin, Balmer, Ruddy, McIlrath, Conlon. Carniny Youth 3, Andersonstown Celtic 5: Carniny missed a great chance to go top of the league with this defeat, which was all the harder to take as Carniny had led 3-0 thanks to goals from Gregg and an Adger double. It was a harsh lesson for Carniny but Andersonstown were deserving winners. Carniny: Cathiness, Johnston, Gregg, Dennison (c), McMullan, Reid, Pogue, Buick, Pajaczek, Adger, Telford. Carniny Youth 3, Ballinamallard 1: Carniny soon put their disappointing result against Cliftonville behind them after a great result against the Ducks. Against the run of play the Fermanagh side scored first as result of a corner and goal mouth scramble. This only inspired Carniny even more and they soon equalised. After great skill by White he laid the ball back to Anderson who whipped a great cross into the box for Aidan Graffin to score with a great first time finish. In the second half, Graffin got his second when Anderson became provider again, with Graffin chipping the keeper from outside the box to make it 2-1. Carniny were now in control and it was Magee who forced the defender into fouling him in the box. There was nobody else going to hit the penalty only Graffin searching for his hat trick. He coolly placed it in the corner to make it 3-1 and put the win beyond Ballinamallard. Carniny Youth: McNicholl, Young, Simpson, Holland, Scullion, White, Anderson, Hamilton, Hunter, Graffin, Magee. Carniny Youth 0, Larne Youth 3: An injury hit Carniny side were up against high flying Larne Youth at Wakehurst and were undone by a couple of top quality goals, as missing players and tiredness took its toll. Carniny Youth: Parker, Fleming, Campbell, Winter, Kirk, Clos, Gordon, Moag, Hemphill, Courtney, Woodin, McKitterick. Carniny Youth 2, Carrick Rangers Colts 1: Carniny faced a physical Carrick team at the Showgrounds in this round 4 NIBFA cup game. It was Seaan Elliott who gave Carniny the lead just before half time. O’Brien after saving a long range effort from Carrick spread the ball out the right to McDonnell who in turn found Bailie Young on the wing. Finding himself in behind the Carrick defence he squared the ball to Seaan Elliott who tapped home to give Carniny the lead and score his seventh goal in his last three games. The high intensity was kept up in the second half with Carniny down to ten after a second bookable offence. However it was the boys from Ballymena who scored next, Seaan Elliott was up ended in the box and stepped up to coolly convert the resulting penalty 10 mins in. Carrick were now down to ten men and Carniny two goals up and then the visitors were awarded a penalty but O’Brien saved the spot kick low to his left. After a second Carrick dismissal, they were awarded another penalty with a good 10 mins still to play. O’Brien could do nothing to save this one. With a good five mins of injury time played Carniny came out on top and go into the quarter finals. Carniny: O’Brien, McDonnell, McCann, Henderson, Downey, Scullion, Marshall, Carley, Little, Young, Elliott, Leetch, Evans. Carniny Youth 1, Ballymoney United YA 1: Both golas came in the first half with Carniny, minus several regular players, made the best possible start when on five minutes they were awarded a penalty and up stepped Tyrone Balmer to score from the spot. Near the end of the half Ballymoney equalised and the conditions had a lot to do with the goal when a corner from the Ballymoney left caught the wind and sailed into the Carniny net. Carniny created numerous chances in the second half but the Ballymoney goalkeeper was also having a fine game making some crucial saves. Much as they tried Carniny couldn’t find the winning goal and the match finished 1-1. Panel; McWilliams, Calderwood, Bunting, Cochrane, McComb, Price, Jaworski, McKernan, McManus, Balmer, Doherty, Letters, A. Johnston.